One of the fencing club's first meetings, where they are practicing the basic movements. The fencing club is something VSU has not had since 2009. However, the resurgence of the club looks like it will be here to stay for years to come. There are still a few obstacles for the organization to overcome, but once they do, they will be set up to grow quickly. The fencing club is centered around the sport of fencing which is pretty big in other countries around the world. Generally, fencing is not an offered sport in high schools in the U.S. However, it is slowly becoming more prominent in universities. 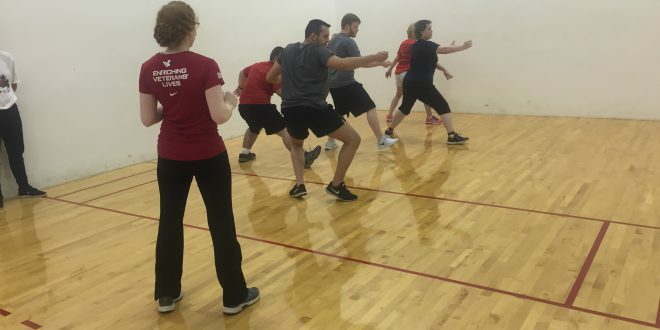 The focus of fencing club at VSU is to introduce interested people to world of fencing without having to pay for the equipment. The sponsor of the organization is Assistant Professor of Music, Dr. Daniel Alexander. He has participated in the sport since he was around eight years old and played it throughout high school in the U.K. President of the club is Jennifer Michaloski, a graduate student of music as well. She fenced in high school, but it was through a facility separate from the school. Both have been meeting with a few others in the music department once a week on Wednesdays to practice fencing and explore ideas. Dr. Alexander’s interest in the sport was sparked because he did not want to play rugby out in the cold. So, he chose a sport that required him to be inside during school. Over in the U.K., schools require their students to play at least one kind of sport. This is why he decided to go the route of inside fencing. His time playing the sport came to a pause after he graduated college, but he picked it up again when he toured Europe and fenced at tournaments when he could. Michaloski has always enjoyed watching and understanding the sport. One of the biggest hurdles the club has to get over is gaining the 10 members they need in order to get a budget from the school. This budget will help them buy equipment their members and people interested in joining could use, so they do not have to buy it themselves. Once this hurdle is passed, the fencing club’s goal is to go to local tournaments with members that are interested in going. They will continue to meet on Wednesdays at six in the rec center. On April 4, when they had their debut and opened the club to the students of VSU, they had seven people in the club. More students said they would come back to the next meeting to see if they really want to join or not. Story by Andrew Farace, Staff Writer. Photo by Prince Robinson Jr., Staff Writer.